MSRLM Umed Solapur Recruitment for 59 posts. 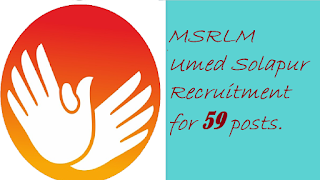 Umed (MSRLM), Solapur, MSRLM Umed Solapur Recruitment 2018, Umed MSRLM Solapur Bharti 2018 for 59 Admin & Account Assistant, Data Entry Operator, Peon, Cluster Coordinator Posts. 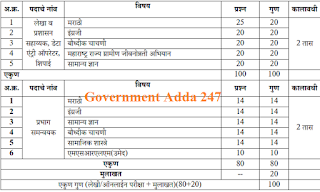 UMED - Maharashtra State Rural Livelihood Mission, Solapur released the notification for the recruitment of four posts as per the notification no. 01/2018-19. UMED recruitment has recruited for the posts of Administration & Accounts Assistant, Data Entry Operator, Peon & Cluster coordinator. The total number of vacancies for this posts is 59. The candidates who fulfil all the eligibility criteria can apply online for this posts. The online registration has been started and the registration will be opened till 18 September 2018. The eligibility criteria to apply for this posts are candidates with Commerce Graduate or HSC 10th pass or degree in BSW, BSC, Agriculture, MBA, Rural development postgraduate degree having any of this degree can apply for this posts. The exam will conduct for the selection procedure of this posts, Those candidates who qualify the exam will get shortlisted. 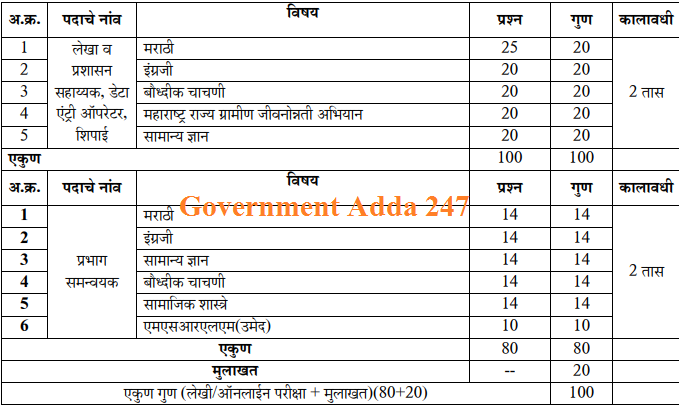 To know more about Umed recruitment 2018 Solapur check the information given below. आयु सीमा : न्यूनतम: 18 साल, अधिकतम: 38 वर्ष, यानी एक उम्मीदवार का जन्म 02.08.1988 से पहले नहीं हुआ होणा चाहिये और 01.08.1998 से अधिक नहीं (दोनों तिथियां सम्मिलित). ऊपरी आयु सीमा अनुसूचित जाति / अनुसूचित जनजाति 5 साल, अन्य पिछड़ा वर्ग 3 साल, विकलांगों के लिये अधिकतम आयु 45 साल, पूर्व सैनिक को 5 साल. ➤WCL Recruitment for 333 vacancies. The application will only be accepted by online mode. The eligible candidates have to submit their application form from the released date of advertisement till the 18Septemberr 2018 on maharecruitment.mahaonline.gov.in which we have provided on Apply online tab. The candidates should fill their application as on mark sheet name otherwise, the application will reject. If the candidate wants to apply for all the posts then candidates have to submit the separate application. Candidates have to go through the online Computer Based Test. In this test, candidates have to solve 100 question in 2 hours. The syllabus and the exam pattern of the exam are given below. That candidate who secures qualifying marks will get selected for further process.